What is Market Replay and Why Do People Love It? Tradovate’s Market Replay allows traders to play back a previous trading session to watch the market action using Tradovate’s charts and quotes. Plus, it can facilitate simulated trades using Tradovate’s DOM, chart trading, order ticket, and third-party add-on tools. 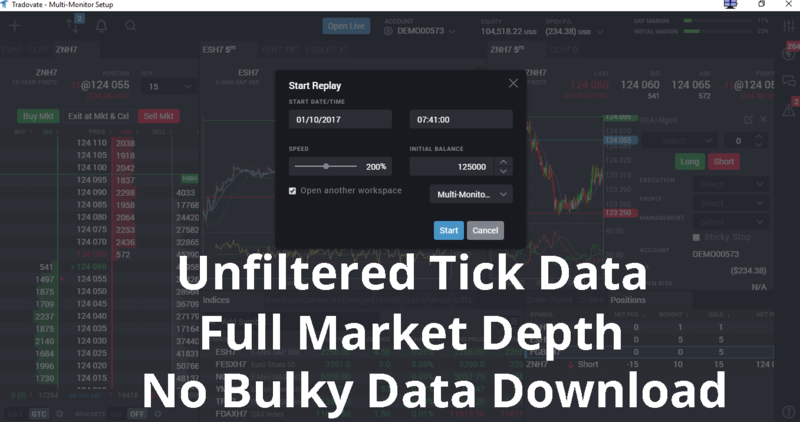 The playback function uses unfiltered tick data and provides full market depth, so traders can see exactly what was happening with every tick in the limit order book when the market moved and trade it. Some traders find the price action when a market opens and closes to be essential factors in their trading strategy. Other traders like to observe how the market reacts to the open and gauge what happens later in the session ahead of the close in order to fine tune their trading tactics. Whatever market information you find important, you can go back to watch it as many times as you would like, and place trades using all the strategies you want with Tradovate’s Market Replay. E-mini and bond traders know that the market can really move when economic reports, like non-farm payroll, are released, and crude oil traders typically get a weekly dose of heavy market action when the Energy Information Administration (EIA) inventory report is announced. The market volatility on those days can throw a curveball at traders, and the best way to hit a curveball can be to watch it come at you over and over. By playing back the market to study the price action in the futures contracts you trade, you may be able to see something that helps you capitalize on an opportunity or avoid a risk the next time around. Practice: Do you ever wish that you could wind back the clock to test something out before you actually did it? With Tradovate’s Market Replay, you can do exactly that. Get in all the practice time you need so you are well-prepared when real-money is at risk. Convenience: Want to trade in the afternoon, but missed the morning session? With Market Replay, you can replay the morning at 400% speed, and get caught up on the action. Use Market Replay to bend the markets to your schedule. Unlike real-time simulated and live trading, the market doesn’t need to be open for you to watch what is happening. On-Demand: With Tradovate, there is no bulky data download, so you can get started in just a couple clicks without having to worry about it freezing your computer. Tight on time? No problem. You can play back in actual time to see price action as it actually happened, or use fast-forward speed to get in your analysis quickly. Tradovate includes market replay in our Active and Advanced membership levels, and you can access market replay directly within the live trading platform simply by switching account numbers.